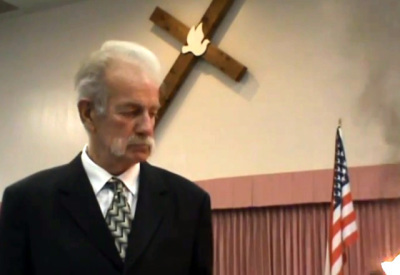 Residents in Mulberry, Fla., have been pushing back against an invitation extended by a local man to have Dr. Terry Jones hold his annual Quran-burning in their town. But the Christian minister has said no one is going to stop him from burning nearly 3,000 holy books to mark the 12th anniversary of the 9/11 terrorist attacks on the U.S.
"I called him to ask if he had found a place, and then it popped out of mouth to invite him to have it right here," explained Bill McKinney, according to WTSP-TV. The local news station reported that the Quran-burning could take place on McKinney's property. The burnings usually occur at Jones' Gainesville, Fla., church, the Dove World Outreach Center that was reported at one time to have 30 members. The church property was sold last month, however, so Jones, 61, took McKinney up on his offer. Suzanne Carter-Moore said that when she heard about Jones' decision, she immediately thought, "Not in Mulberry!" "Why would you come to little Mulberry that is peaceful and diverse?" Carter-Moore questioned. "We like it that way. Why come to our town and stir up the pot of hate and division?" The local mayor and other officials are reportedly against Jones holding his anti-Islam protest in their town, but will not intervene. "He's not welcome as far as I'm concerned," Mulberry City Commissioner James Splaine told TheLedger.com. "That guy in my book is just nothing but a troublemaker. You can't start messing with people's religions. Whether you like them or not, it's up to them to have their own religion." To show disagreement with Jones' "worldwide burning of 2,998 Qurans," Carter-Moore and her small group will counter-demonstrate on Sept. 7. The group has been using Facebook to get the word out and attract more supporters. "Not in Mulberry Terry Jones" is the name of the page started by Carter-Mmoore late last month to attract other locals to her cause. So far, 194 Facebook users have liked the page, and it seems to have attracted more critical comments than supporters. "He has every right to burn the Quran or any so called holy book and you have the right to protest that but you have no right to stop him," wrote a visitor to Carter-Moore's page. Another commenter asked for the Mulberry woman's opinion on the Million Muslim March planned for the 12th anniversary of 9/11 on Washington, D.C. and suggested that she should be more concerned with that event. Carter-Moore has not responded to the questions or criticisms on the Facebook page, but concedes Jones' right to protest. "Mr. Jones may have a constitutional right to free speech and that should be defended, however just because you have a right doesn't mean it IS right to take such actions," the Mulberry woman asserts on the group page. "Regardless of his right to burn the Quran, the residents of Mulberry feel Terry Jones should choose another city to make his statement." Jones, who calls Islam "the greatest threat to national security," insists that his group "did not choose Mulberry, Mulberry chose us." "There's actually no way to stop us. We are going to do it," said Jones, who has carried out holy book-burnings before in addition to hanging an effigy of President Barack Obama on his former church property. The Gainesville, Fla., minister claims his protest is not against Muslims, but is instead meant to draw attention to what he calls "that violent core message that Islam has." Jones explains in a promotional video for his planned "worldwide burning of 2,998 Qurans," that the demonstration was organized "in order to stand up for the Constitution and honor the victims of 9/11." The specified number of Qurans is meant to match the estimated number of lives lost in the Sept. 11, 2001, terrorist attacks on the United States. "Send us your Qurans," Jones implores viewers of his promo video who may have lost a loved one on 9/11. In the same video, Jones stands with a Christian cross marked with a dove behind him and the American flag to his left as he holds a Quran off camera to be set on fire, before holding up the flaming book on screen. Jones carried out his first Quran-burning in 2011, after cancelling plans the year prior to carry out the act in protest of an Islamic center near the Ground Zero site in NYC. The 2011 demonstration, meant to "put the Quran on trial," was linked to subsequent mob violence across Afghanistan that left at least 16 people dead, including seven United Nations employees, and more than 90 others injured. In 2012, Jones was involved with the promotion of an anti-Prophet Muhammad film, "Innocence of Muslims," that U.S. and Egyptian authorities blamed for inciting more deadly protests in several Middle Eastern and North African countries. The Rev. Rob Schenck, an evangelical Christian who is often critical of Jones, said at the time that although the controversial minister has a right to exercise his freedom of speech, his behavior puts the Christian faith in a negative light. "It is sad and reprehensible for a Christian to mock and deride others as Terry Jones has done. Jesus taught that we are to treat our neighbors as we ourselves would be treated," said Schenck. "His actions are definitively un-Christian and maybe even anti-Christian. Nevertheless, he has an inherent right to air his opinions, regardless of how preposterous they may be." Jones has said he is aware that his persistence in burning Qurans again this year might spark more violence. "We are, of course, not wanting the violence ... but we will not let death threats against our life, or threats of violence deter us to speak out and raise awareness to the definite danger of radical Islam," he said. Terry Jones, 7 US Christians Face Arrest Over Anti-Islam Film?